You know “The Gunny.” R. Lee Ermey has had over a 100 film and TV roles, everything from Apocalypse Now to Toy Story. You’ve seen him on Mail Call on the History Channel. He was the drill sergeant in Full Metal Jacket who pushed Vincent D’onofrio to the brink. The Gunny started out as an advisor on the film, but Stanley Kubrick liked him so much that he gave him the role of Gunnery Sergeant Hartman. 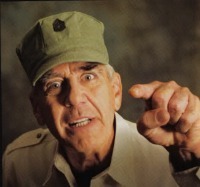 Before he became the quintessential drill sergeant character actor, Ronald Lee Ermey spent 11 years in the US Marine Corps. He served 14 months in Vietnam and did two tours in Okinawa. When his military career was cut short by injuries, Ermey posted up in the Philippines. He studied Criminology and Drama at the University of Manila, and he began appearing in films in the Philippines. His role as a helicopter pilot in Apocalypse Now led to other acting and advisor roles. He served as a technical advisor on the film An Officer and a Gentleman, and he went on to appear in films like Fletch Lives, Toy Soldiers, Se7en, Mississippi Burning, both Texas Chainsaw Massacre movies and X-Men 3. When The Gunny isn’t acting, doing voiceover work, teaching people about military history or showing up in Geico commercials, he finds ways to support the troops. The Gunny recently teamed up with WD-40 for the Drop and Give Me 40 promotion that supports three different troop charities. When you purchase Limited Edition WD-40® Collectible Series cans, the WD-40 company will donate 10 cents for every can purchased to the Armed Services YMCA, the Wounded Warrior Project and the Veterans Medical Research Foundation. To learn more about the Drop and Give Me 40 campaign, visit supporttroops.wd40.com. Print article This entry was posted by Chris Stout on April 18, 2011 at 11:55 am, and is filed under News. Follow any responses to this post through RSS 2.0. Both comments and pings are currently closed.